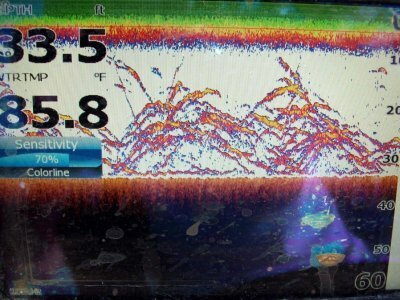 Most days the stripers have made some good morning runs along the deep water ledges. Some days they stay on the ledges longer than other days, but one thing is for certain and that is they are running in different areas almost daily. This week we were catching some large stripers in the 15 to 16 lbs. range with alot of fish over the 20 inch mark. Now is the time of year you really need to measure your fish. Some of these stripers are just to close to assume they are under 20". 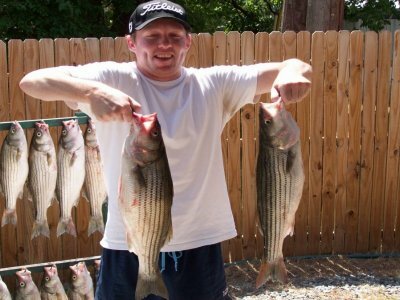 Remember Lake Texoma limit for Striped Bass is 10 fish per day and only 2 of the 10 can be 20 inches or larger. 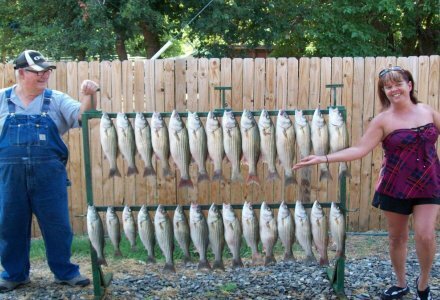 If you can brave the heat for a couple hours and would like to experience some fantastic Lake Texoma striper fishing, now is a great time to do so. On the weekends you can count on there being anywhere from 60 to 120 boats trying to get on one school of stripers. If you find yourself in the middle of this mess, be very careful and courteous. Keep a keen eye on those around you as we've seen a few scraping from boats bumping into each other by over eager fishermen.